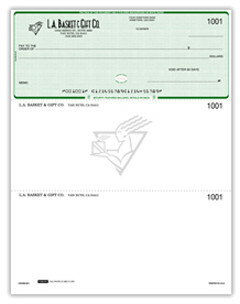 Laser Logo Business Voucher Checks & more for Less! Pricing includes: FREE Logo/Watermarks, FREE Shipping & Rush! Company Logo to a complete new custom design, we can do it all! Send us an email and give us a call with questions about needs. logo will determine the quality of your imprint. Line art should be at least 300 d.p.i., grayscale at least 600 d.p.i. applies to New Orders and Re-orders 1,000 to 10,000 quantities in the lower 48 U.S. States only! Thank you to all our faithful clients! State sales tax only apply to California deliveries. Deliveries to all other US States will receive non-taxable client status. Pricing applies to New and Repeat orders. Re-orders with new logos, etc, may incur minor composition charges. 2011 Sterling Business Services, Inc.